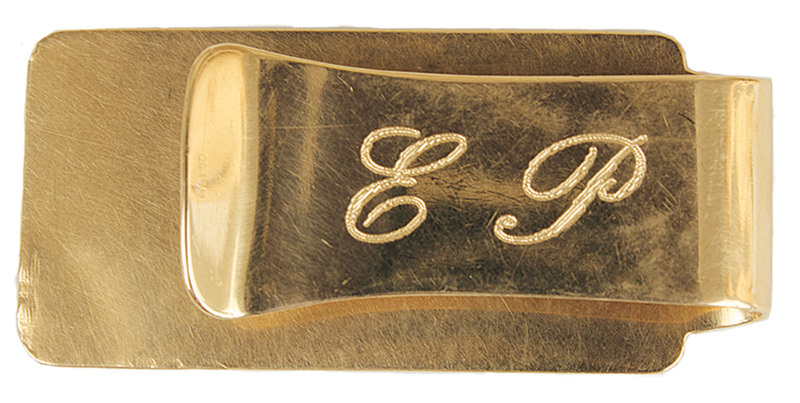 This is Elvis Presley's owned and used 14kt gold money clip with the TCB logo with diamonds set in the lightning bolt and his engraved "EP" initials. He gifted the money clip to his close friend and Karate teacher Ed Parker, who also accompanied him on his national tours as protections. Elvis gave Ed the money clip one night in his suite at the Las Vegas Hilton where he was performing. Elvis dropped the money clip on the floor, and when Ed picked it up and tried to give it back to him, Elvis said "can you prove it's mine? It's got your initials Ed", and Ed realized that this was his way of giving him this special money clip. Very good condition. Comes with a letter of provenance from Ed Parker on his International Kenpo Karate Association letterhead and a Gotta Have Rock & Roll™ Certificate of Authenticity.